Today is the last day of the year and what a year it's been for me. 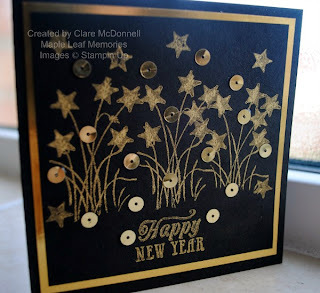 I joined Stampin Up back in February and have been on a bit of a rollercoaster ride ever since. I started teaching my craft classes which have been popular with everyone who attends them. I was lucky enough to travel to England several times this year to meet up with my extended team of fellow demos, including several from the Netherlands. I also welcomed three new members onto my own growing team and have learnt so much and have been inspired every step of the way. I wanted to make a card to celebrate the New Year and the first thing that came to mind was fireworks, so I used the Wetlands set and the gold Encore ink from the winter catalogue but I overstamped the top part of the rushes with the little star which is part of an upcoming Sale-a bration set called Banner Blast and a sneak peek item from the new spring Summer catalogue-which is the lush gold sequin trim which I was lucky enough to get for free at convention. I cut the individual sequins free from the trim before attaching them randomly over the card. I want to wish each and every one of you a Happy New Year and I hope 2014 holds good things for all of us. Thanks Margaret, Happy New Year to you too!